I was looking at a pair CTI 100 how long should i go? Im 170 cm tall 75 kgs and 57 years old with 2 bad knees, but im a good skier, my natural instinct would be to go for the 172 cause i feel comfortable around that length. What do you advise and how well do they handle icey conditions? Even for your height and weight and age the 180cm would be the more appropriate ski length as they ski really short. The early taper and early rise on the ski make the ski, ski so much shorter than its actual length. If you are not very aggressive at all then you can do the 172cm length but these skis ski amazingly short. They handle icy conditions with ease and are one of the most easiest skis for all levels to ski. Thanks, one more thing how do they compare with a Boneafide 172 in swing weight and feel, i skied them at Whistler in January and thought they had balls but i think after 2 days they would become work. Fun and performance is what i want. I just broke a pair of Annex 98s…they were easy to use but they could have been a little stiffer. Night and Day difference from the Bonafide to the Vantage 100. Not only is the Vantage lighter and quicker they also have a much tighter turn radius and unlike the Bonafide the Vanatge 100 will not wear you out after a day or two of having to work the ski. Thinking its time to upgrade from my Icelantic Shamen’s. Not sure what length – I’m 5’8″ and 160lbs, was thinking the 172cm but then again……. You should go 180cm with these, they really do ski that short. If you were 5’4″ and 140lbs then the 172cm we would suggest. I’ve just moved to the Canadian Rockies for 2 years and need to get skis. I’ve been researching Mantra, Bonifide, Fischer Ranger & Motive 95 ….. and now I see these Atomic 100’s. Your review makes me think this could be the one … are they really that good … and do you think they work for guys like Peter and myself? Like I told Peter you guys can go with either a 172cm or 180cm. If you are more comfortable with the 172cm go with it. These skis do ski short and much quicker than a Mantra or Bonafide and will not wear you down nearly as much as those skis will either. The Vantage 100 is a go to one ski quiver ski. Peter; I have skied the Atomic Alibis for the last two seasons and love them as a 98mm one ski quiver. Will I notice a big difference between that ski and the new Vantage 100? I have skied both and there are a couple big differences that you will notice. The first is that they turn quicker than the Alibi does and the other is that they also ski much shorter as well. Still super stable and playful just with more versatility. Yes the Vantage 100 ski would still work excellent if you did get some good powder days thanks to the rocker and big shovel that the skis have. Nope not long at all they are actually 188cm… Rossi Squad is a short thing at 186cm, almost 2 inches shorter than its advertised length. They ski super short and you would not want shorter than the 188cm. Once you get out on them you will see quickly and how easily they ski. Was wondering where to mount bindings on the vantage 100? Should I stay with factory recommended line? The Vantage 100 skied best mounted at Factory. I’m 6ft tall, 180lbs and would be classified as an advanced skier. I like to mix it up on the hill and tend to gravitate towards a shorter ski as I like to be nimble in the trees and bumps. Should I go 180cm or 188cm? You can easily do either length. For your height and weight I would say 188cm, but you mention you like shorter skis. Theses skis do ski short with the way they are designed. If you want to go short go with the 180cm, but if you don’t mind 188cm that is the appropriate length for you. I am also not sure which size to go. I am 5’6″ weighing 139 pounds. I would classify my self as a very good skier would think based on your comments that the 172cm could be on the short side. Because of your weight the 172cm would certainly be appropriate! I recently demo’d the Vantage 90 in 184s. It was a good ride but I’d like something a little fatter and faster, if that’s possible in this series. I’m an ex racer from the Northwest; I like to rip GS turns on hard pack but also drop into shutes and blaze through chop. Is the Vantage 100 a good option? At 5’8″ and 150, what length should I be looking at? Thanks! Yes, the Vantage 100 will be a little fatter and more versatile in all conditions. At your height and weight certainly the 180cm would be a great choice. I was very pleased at how well the Vantage 100 turned at higher speeds and its ability to grip the snow. I’m coming off a pair of Nordica Hot Rod Afterburners (170). 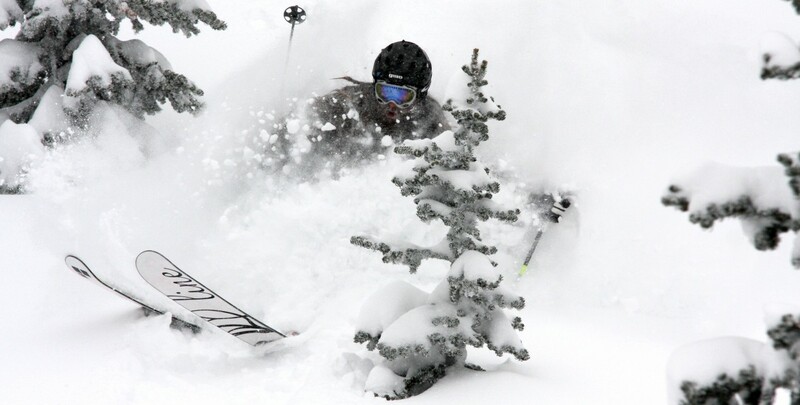 Ski mostly Northwest US conditions, am 5′ 10″ and 195. These seem like a great upgrade in a 180. Also looking at Nordica NRGy 100s. Any thoughts? Thanks for the awesome review. In the Atomic Vantage 100 you would absolutely want to go to the 180cm length. Nordica NRGy 100 is also a great ski I just like how light the Vantage felt underfoot more. They really did a great job with this ski and it has been a long time since I have been on anything from Atomic in this range of ski that I have really enjoyed until now! Hi, I am skiing Japan in 2 weeks & am looking at the Atomic Vantage 100. I have skied 30+ years, ski aggressively and love making lots of turns in powder & trees, I this the right ski for me? If you are looking for a straight up powder ski there are other skis that would work very well, but if you want one ski to ski groomers and off piste the Vantage 100 would be a great choice for you. thanks for that, any suggestions for a straight powder ski – what about the head monster 108? How aggressive of a ski are you looking at? If you want more of a Powder Ski you may want to look at something such as the Volkl 100Eight, Line Sir Francis Bacon, Head Cyclic 115 and the K2 Shreditor 112.The Monster 108 is an amazing ski but built more for hard charging. You really seem to know the vantage ct 100 well. I am really curious about this ski. I have now had 2 days on the ct 90 at 184 length. I can say, without reservation, it is the best ski I’ve ever skied on for west coast groomer snow……it rips. I am thinking the ct 100 would be a great ski for more variable conditions. I’m 5’10, 175 lbs. I have skied the ritual for a couple years at 181cm, so I am curious what you might suggest, with your experience. 180 or 188? Glad to hear you enjoyed the CT 90 so much, that too is an excellent ski. As awesome as the CTi 90 is the 100 will be even more versatile. If you are skiing Ritual in the 181 we would suggest the 180cm in the Vantage 100. If you weighed another 30lbs heavier then we would say the 188cm but for your height and weight the 180cm will work well. I currently ski a vantage-Theory 177cm (I am 176cm and 71kg) and love everything about this ski….Short turns, carving and powder are all great. I ski about 50 days/year and about 60% are piste days and whenever possible off-piste. I never feel that the Theory (95mm/waist) is too wide. I need a replacement ski due to damage. So I not looking for a narrower/wider ski as such but maybe a ski to bring things to the next level. I currently ski a vantage-Theory 177cm -I am 176cm and 71kg and love everything about this ski….Short turns, carving and powder are all great. I ski about 50 days/year and about 60% are piste days and whenever possible off-piste. I never feel that the Theory (95mm/waist) is too wide. I need a replacement ski due to damage. So I not looking for a narrower/wider ski as such but maybe a ski to bring things to the next level. I would suggest moving up to the 180cm length in the Vantage 100 CTi it will do everything your Theory would do and more. The 100 is just so versatile there is no reason for you to replace with the 95C. If you were lighter then maybe i would say the 95C but for your height and weight the 180cm in the 100 CTi is the best option for you. You are so generous in your replies , thank you. Thank you! The 90 CTi also skis short like the 100. For your height and weight the 180cm is easily going to be the correct length in the 100/ If you are doing the 90 CTi you cna get away with the 176cm because the ski is a stiffer ski than the Vantage 100 is. Can’t go wrong with either ski. If you are going to spend a majority of your time on groomers then I would say the 90 will be ok, but if you are spending as much time as you can skiing the sides of the trails and seeking out any fresh snow go with the Vantage 100. You have provided the most useful information on the vantage line anywhere! Many thanks!! Sorry to ask yet another question about height/weight/length. I had been considering the 90cti in 176cm, but your last couple of replies make me think I should be on the 169cm. I’m 177cm tall, but only 145lbs/64kg, advanced when everything goes to plan, but not extremely aggressive. I ski mostly on piste (which is why I’m thinking about the 90cti instead of the 100cti), but want a bit more versatility for powder and chop than my current skis provide. What do you think? I’m also considering the Fischer Ranger 90ti, but I think it might be too light even for me. Again, many thanks for your help, and apologies for asking such a dull question! Oops! That comment/question was meant to be directed towards Adam, not Chris. Sorry! No worries! Both factors have to be taken into account. If you are 177cm tall then the 176cm in the 90 CTi would be what i suggest if you are an aggressive skier. If you are not super aggressive then you could do the 169cm length. With skis like the Vantage Series i would always prefer to go longer than shorter since the amount of taper and rocker on these skis make them ski much shorter than they actually are. If you don’t feel you need the metal in the ski you could also go with the Vantage 95C which has Carbon instead of Ti. Many thanks Adam! Really appreciate your help! Many thanks for all the replies on sizing. We all appreciate it very much. The Vantage series is really opening up a new world of fun to all levels of skiers and your super knowledgeable help seems spot on every time..
What would be your picks in that list? Is there any skis you wouldn’t recommand for what I intend to do or for someone my size? Skis you should be looking at are the Bacon, Blend, Head Collective 105, Pinnacle 105 and the Vantage 100. Venturi 95 is fun but the Colelctive 105 is more versatile of a ski when you get it in bumps and and tight trees.It is hard to say anything bad about the Bacon for me that is always a go to ski. And if a 105, Collective or Pinnacle? Do you see me on a 181 Collective at 6′ and 215 pounds? Because I don’t see myself on a 191 cm ski in thight trees… In fact, let me rephrase this: on which skis that you recommanded me, would you see me on a shorter lenght without too much compromises? If you were to get the Bacon in the 184cm that would be the same length as the Collective as they measure about 180.6cm. So I reduced my choice to SFB, collective 105 and pinnacle 105! The advantage of the Pinnacle is that it is a true 184 cm but looking of videos of the Collective, it looks like a better carver… Thanks again for your help! Trust me this is the ski industry… there is nothing logical about how a company publishes a ski length. K2 had skis for years that were published as 179cm were they really measured 184.5cm… There are very few companies that their published length is the actual length… much like ski boot flexes. A 100 form one company can feel completely different from another 100 Flex boot even from the same company but in a different model.. We honestly feel anyone and everyone can benefit by going to wider than 95 in the waist unless purely carving on groomed slopes. Pinnacle 105 actually measures 185,5cm in the 184cm length. You can’t make a bad decision with those three skis you have chosen. The Collective 105 does carve slightly better than the Pinnacle but they are very similar skis from 2 different companies. Bacon is awesome too but if you are not use to a ski that is mounted just a couple cm back form Center and you like to drive the tip at all you will want to decide between the Collective and Pinnacle 105. Great review. This sounds like the type of upgrade I am looking for. I been using Watea 94’s at 178cm since 2009 as my powder skis on regular trips to Niseko Japan. OK, I know some might say they’re a little skinny for powder skis, but I like to be IN that powder, not skimming over the top, and I love skiing short turns – a finesse type of skier. I am not a hard charging/power skier. When I’m in the (Niseko) powder, I’m not in a hurry to get to the bottom at mach 2 speed, I want to savour every moment – turn turn turn, face shot face shot, face shot……. Anyway – I am 173cm/5’8″, 65kg/145lb, and I have been thinking at times when the snow is a little heavier, or in tight places, I could do with a shorter (= or more nimble ski). That said, I have never liked short skis. Until I bought Blackeye Ti at 173, for my front side ski, I had never skied anything less than 175 that I liked. I love the Blackeyes. The early rise tip makes the ski so versatile. I can make any shape turn I like. I digress. I have read some good reviews on the 2016 Ranger 98ti, especially for my low weight. It sounds like this might provide the improvement I am looking for, but I see that the Vantage is getting much better reviews, including, and especially in powder. Reading all your other recommendations on length, I suspect you might recommend 180, since my watea’s are 178, the Vantage have smaller radius, and early rise tip should give me the extra manoeuvrablilty/nimbleness I am looking for. The only other options that have caught my eye are Salomom Q98, nordica enforcer or should I go for the Automatic 102 as a more dedicated powder ski – although this ski has slightly longer turn radius, and has been reported in reviews as competent but not exciting performer.